I don’t think I was long enough in any one place to feel jet lagged. The final stretch was flying back to San Diego, then catching the trolley to Tijuana and walking back across the border into Mexico (took about 2 minutes compared to 2 hours in the other direction). Then an uber back to Baja Naval in Ensenada where Aretha was waiting for me along with two crew from Team Aretha. For the next part of this expedition, we are rejoined by Paul and Jani. Both have been part of Team Aretha from Day 1 (and indeed before when Jani used to call me Mumbo Jumbo for having this crazy idea to sail the world). Jani was there on the shake down sail when my back went and couldn’t walk. 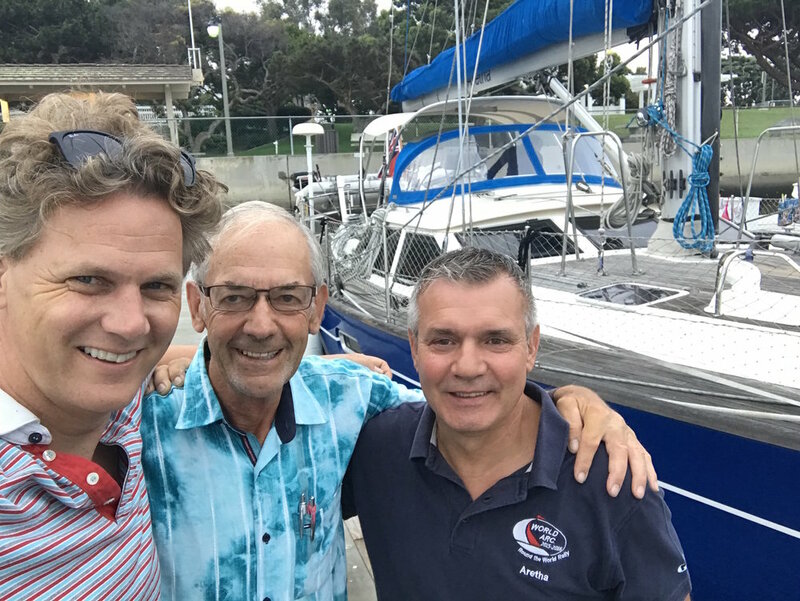 Both joined us sailing the Atlantic from the Canary Islands to St Lucia, and then from Cape Town to Brazil. They know Aretha as well as anyone and it was lovely be welcomed back on board. They had arrived the previous day and had already been busy on board fixing things and provisioning Aretha. In my absence, the team at Baja Naval had been at work and had replaced the canvas work on the sprayhood and bimini and together with the new paintwork and varnish, Aretha was looking stunning and like a new boat. We planned to leave the following day. Our next destination was San Diego where we’d clear into America and get our Cruising Licence. To clear out of Mexico (took half the day) and most importantly..
To take a trip down memory lane. Here in Ensenda is a boat called IronBarque. She used to be called Quadstone. She is in fact the boat that Paul and I were on when we circumnavigated on the BT Global Challenged in 2000-01. To say it was emotional is an understatement as we the Captain invited us on board and we walked the decks and stirred a thousand memories in the galley where meals were cooked, the saloon where sails were mended, the sail locker, the bunks, the nav station and much more. I asked Paul what made the memories so special. His answer was the people. It’s always about the team. The people you spend time, the experiences you share, the memories you create. After receiving our final paperwork, we slipped lines in the afternoon and headed out into the Pacific. The breeze was light, too light to sail and we had a night of motoring ahead of us. It’s some 80 miles to San Diego and after a fairly uneventful night, we see the lights of the City ahead of us. There is a good amount of shipping around and we have to be alert. We can the lights of one large vessel close by on our starboard side. We are slowly closing on her. Worryingly she does not show on AIS (that's the digital tracking system that is mandatory for all larger vessels). I slow down to let her pass in front of us. A minute later, the VHF crackles into life. Sailing Vessel Aretha, this is Warship. What are your intentions? No caffeine needed. That fires a shot of adrenaline. It makes more sense. Warships don’t want to show on AIS. I call back and let them we are waiting for sunrise to enter San Diego and clear in. Warship satisfied she turns to port and slowly edges away. As the light comes up, we can see she isn't any small ship. She’s an aircraft carrier. We find our way into Customs and Border Patrol and spend the next 8 hours clearing in and arranging our paperwork. By mid afternoon I’m feeling a little jaded from both lack of sleep and officialdom. One of my life hacks is to ask and then follow advice on Facebook. One recommendation we had for here was to go to La Jolla. An hour later after an uber ride and we are surfing in the warm waters and soaking the sun on the beautiful La Jolla Beach. It’s the perfect wake up moment and is followed by a memorable supper at a local restaurant. This stretch of coastline is relatively windless being sheltered by the large land mass that stretches inland from Point Conception. Our next stop is Newport Beach and is another day of motoring. It’s uneventful and we arrive just before sunset and manage to pick up a mooring buoy. We have chosen Newport Beach as I’ve been booked to be Keynote Speaker here for a brilliant fast growing technology company, Kareo for their annual Customer Success Event. It’s also relatively close to LA and that evening Nichola and the children are flying in to join us for the sail from here to San Francisco (and making the most of all that California has to offer). I meet a tired and excitable family as they arrive via Uber and I dinghy them to Aretha. They children waste no time in charging all around her and rediscovering toys, bunks, hatches to climb in and out of and get back into boat life. It’s lovely to just watch and see their fluency with this world where digital devices fade in importance and family life and shared experiences magnify. We are all on the boat for 24 hours together before I have to pack my speaking clothes and get in the zone for speaking to Kareo. I head off mid afternoon to the hotel some 5 miles away leaving the family happily playing on Kayaks. The evening is spent meeting lots of interesting people and learning about the opportunities, issues and challenges that everyone faces. I’m always fascinated to learn from others and everyone is willing to share and be very open. A highlight of the evening is taking a “Duffy Boat” ride, a tour in an electric boat around the harbour and we go past Aretha. My speaking slot is before lunch and its lovely to sign books and hear many kind words over lunch. As my time with this amazing team draws to a close, my head now needs to shift gears again back to boat life and prepping Aretha the following day to head back to sea and our next destination of Santa Catalina Island.